The Alliance of Concerned Teachers and its allied organizations at the Commission 11 of the International League of Peoples Struggles (ILPS) condemn the massacre of 12 teachers and many others injured in a teachers strike against the neoliberal evaluation system imposed by President Enrique Peña Nieto. Peddled by the Mexican government as part of “educational reforms,” the militant teachers union, CNTE, has exposed and opposed the evaluation system as a justification for mass layoffs and repressive measures aimed at controlling educators in urban, rural, and indigenous communities. We express our deep sorrow over the deaths of our comrades and fellow teachers, and our solidarity with the continuing heroic struggle of teachers, now joined by various sectors in Mexican society. In 2013, President Peña Nieto presented his so-called “education reform” as part of the 11 neoliberal reforms to be implemented within his first 20 months in power. This is the same president made famous by Philippine mainstream media on “APEC holidays” in November 2015. Media muted massive protests and sharp criticisms against APEC as it amplified a sexualized discourse on neoliberal violence by celebrating one of the most fascistic presidents of modern democracies, no less than Peña Nieto, as “APEC hottie.” The same “hottie” presided over the disappearance of 43 students from Ayotzinapa teaching college in 2014. Not one of these students have been surfaced to this day. The neoliberal model of evaluation in the field of education was introduced in Latin America in the 90s. Aligning itself with the market logic, it is a kind of evaluation system that is punitive and uniform.Its outrageous control over teachers’ demeanor and other significant aspects of teaching style and content reinforce a fast and easy education customized for the consumer and adapted to market demand. The neoliberal model of evaluation is a prescription by multilateral credit organization–banks, financial institutions–in order to foster a vision of education that correlates quality education to cost efficiency. It is therefore a vision of education that aligns the institution with business logic and the interests of big corporations. It is a neoliberal education that galvanizes competition and antagonism between and among education workers and students as it also reinforces individualism. As subsidies for public education shrinks on account of neoliberal policies, severe deficiencies in infrastructure, materials, salaries, scholarships, and other horrid conditions hamper the educational process. Yet structural and historical causes of the same are not discussed by “education managers” in solving the current obstacles to quality education. We are not for sale, Education not for sale! 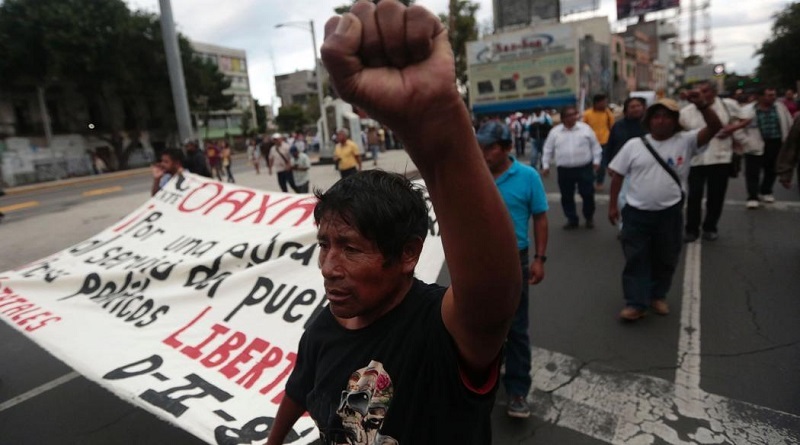 Through the militant action of the teachers of Mexico, teachers all over the world are reminded of our duty to defend academic freedom and creativity. Our martyred teachers will be honored as modern-day heroes who refused to enact and implement procedures that are determined by others. Our comrades from Mexico who persevere in opposing the transformation of schools into businesses that prioritize profits over human needs deserve our support. We at the Alliance of Concerned Teachers and Commission 11 of the ILPS will continue to persevere in our educational work and campaigns against the attacks of neoliberalism on education. We are determined to prove that within different national settings, the common need remains to be our common fight for education and a world that fosters life, dignity, and freedom. People over profits! We call on our fellow education workers worldwide to demand an international human rights-based and independent investigation on the massacre of and brutal measures against striking teachers, and for these investigations not to cease until justice is done.